Yes, all of these men wore computers, and looked good doing it. These days, it's not just techies wearing smart devices either. Everyone from athletes to businessmen are doing it. Here are six dudes who might benefit from putting on a gadget. Not everyone has a wise caddy to give them advice and fight off alligators on the golf course. The Zepp sensor ($150) might be the next best thing. 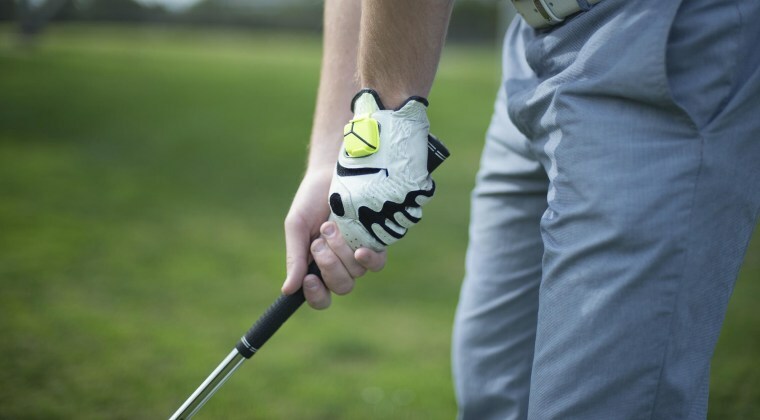 The tech-savvy golfer can clip this thing to his glove and get feedback on everything from the speed and arc of his swing to the angle of his hip rotation. He can then review the data on his iOS or Android device and compare stats with friends. Next stop PGA Tour? No, probably not. But maybe people will stop calling him "Triple Bogey." Nothing is less suave than neurotically checking a smartphone. A casual glance at the wrist? Much cooler. A new wave of smart watches running Android Wear are on the horizon, including the yet-to-be-priced Moto 360 (above) and LG G.
The Pebble Steel ($249) does not run Google's software, but it still looks pretty sharp. Next time someone asks him, "What time is it?" he can look down at the computer on his wrist and reply with confidence, "The future." Consider this bro-lemma: Chaz spends all day at the gym, but it's socially unacceptable for him to walk around sans shirt, and all of his friends are already sporting the same Under Armour tank. What he needs is the new sleeveless shirt from OMSignal ($85.15), which accentuates his sweet guns and lets him record his breathing regularity, heart rate, and calories burned with a tracking module ($133.85). He might also want to buy the Atlas wristband ($179), which can track his reps at the gym. His bros are going to be so jealous. With all of the sporty gadgets out there, it’s a great time to be a jock. But what about America’s hipsters? Google Glass ($1,500) has them covered. Bold titanium frames (an extra $250) will let them tweet their way through "The Recognitions" or post photos of their organic bourbon cocktails without requiring them to touch their phones. There are stylish smart wristbands out there, like the Jawbone UP24. But some people don't want to walk around like a cyborg with devices attached to every part of their body. The Dash ($299) solves this problem by tracking vitals, distance and more while serving double duty as headphones, which can connect to a smartphone via Bluetooth or be used as an independent MP3 player that holds 1,000 songs. So while everyone is fumbling with headphones that are connected to a smartphone that is hooked up to a wristband, the Dash owner is running free, making is dreams come true to the smooth sounds of Hall & Oates. Power lunches. Networking. Synergy. These are the things that today's business elite are focused on. They don't have time to do things like pull out their wallet to pay for things. That is where the Power Suit comes into play. It has a near field communication (NFC) chip built into the sleeve that essentially makes it a wearable Visa card. Other people pay a lot of money for their suits. This suit is actually made of money. Game of life = won.